Israel’s pork problem and what it means for the country’s Christian Arabs. What a change to one of the most controversial laws in Israeli history could mean for the country’s Christian Arabs. Photograph by David Silverman/Getty Images. On the eve of Israel’s independence in 1948, as the new nation faced the challenge of building a country in the midst of war, early leaders debated many hot-button issues: what to do with Arab refugees; how to settle hundreds of thousands of immigrants; and, perhaps most unexpectedly, should raising pigs be permitted. Pork was so controversial not just because its tasty incarnations are forbidden under Jewish law, but because the nature of Israel’s Jewish character was seen as an issue that would define the young state. Politicians and writers all weighed in on the subject. While Orthodox politicians made their case on religious grounds, even Natan Alterman, a secular poet, saw the symbolic importance of a nationwide pork ban. He wrote in a Mapai party newspaper column, “When a Jewish nation makes a pig a sine qua non, its history shudders.” Yet, many socialist Zionists philosophically rejected basing national dietary laws on traditional Judaism. Secular journalist Meir Bareli, who appreciated the gravity of the pork taboo, saw the cheap price of pork during a decadelong meat shortage as a primary reason to keep its production unrestricted. The story of Israel’s contemporary pork industry dates back 50 years, when the Knesset passed a law banning the production of pork in Israel. The law—considered to be one of the most controversial in Israeli history—was designed with a loophole that permitted raising hogs in majority Christian regions in the North as a concession to Israel’s religious minorities and the young democracy. As a result, Christian-Arab towns became hog country. Although ultra-Orthodox politicians over the years have attempted to fully ban pork production, the law has limited the growth of the industry while simultaneously protecting Christian pork interests. A little over a month ago, a panel of Israeli government officials recommended out of the blue that Israel change its pork law to transfer Israel’s industrial hog farms to the South to “reduce the density in which swine are raised” and regulate the farms. When pigs are the topic of the day, they usually get caught in the middle of a political firestorm. While it should come as welcome news to casual observers of Israeli politics that the government is taking an interest in the welfare of its domestic animals, moving Israel’s hogs would most likely disassociate pig farming from Israel’s Christians and could spell the beginning of the end for both Israeli-grown ham and the livelihood of Christian Arabs. Pork is often considered more verboten than shrimp or crab (also not kosher) because over the course of millennia various peoples have persecuted Jews by singling out the pork taboo to humiliate and punish them. Greeks forced Jews to eat pork against their will during the Jerusalem conquests in 167 B.C. ; the Spanish forced Jews to eat pork to prove their newfound allegiance to the Catholic Church during the Inquisition. Pork is therefore more than just a food restriction in Israel; it is symbolic of broader conflict within Israeli society, reflecting not just prosciutto preferences but, more importantly, the delicate balancing of secular and religious interests in a Jewish democracy. Over the years, religious Israelis and their secular counterparts have grown divided and tensions over religious restrictions on society have been a consistent source of political strife. Pork is a particularly thorny issue in this regard: Many secular Israelis enjoy openly, and many ultra-Orthodox Israelis try to fully ban—and have tried for decades—just as they have supported banning buses from riding on the Sabbath and shunning women who dress immodestly. 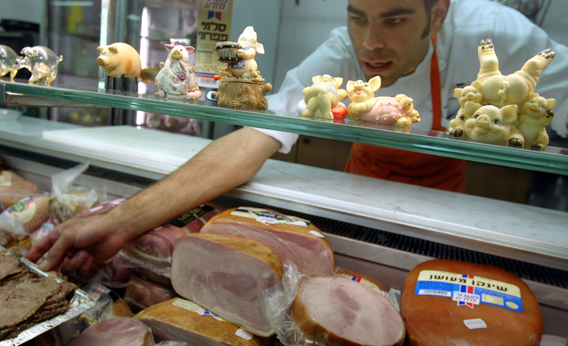 Until the 1990s, the Israeli pork industry was somewhat clandestine, but with an influx of immigrants from the former Soviet Union and a progressive Supreme Court, pork became more common in Israel. As the political tide of the nation has swung to the right under Benjamin Netanyahu, certain pork eaters have reason to fear that the religious interests in government will attempt—as they have done many times prior—to limit pork production in Israel. The Ministry of Agriculture’s recent interest in pig farms claims to be singularly focused on the poor environmental and health conditions. It is certainly true that the farms of the North in the towns of Ibilin, Mailya, Kafr Yasif, and Nazareth are crowded and unsanitary, a fact that I corroborated by personally driving through Ibilin nearly four years ago. As much as I tried, I could not escape the noxious smell of pig excrement, even with the windows rolled up. Israel could very well enforce stricter standards on its existing farms rather foot the bill to relocate 26 industrial operations, though when asked, the Ministry of Agriculture did not respond to my question on the matter. If the initiative passes, the implications for the fate of Christian Arab local economy would be grave, in a region that has seen its Christian numbers dwindling. Plus, Christian Arabs are unlikely to abandon the villages they’ve populated for generations to relocate to the harsh desert climate. Egypt set an unfortunate precedent three years ago when under the guise of “a general health measure,” former President Hosni Mubarak gratuitously culled the country’s 300,000 pigs during the swine flu outbreak. The Coptic Christian pig farmers were hit hard in what was seen as a bigoted attack against a vulnerable population. Ultimately there is a chance that all Israeli pork eaters could be the losers, not just Israel’s Christians. As it stands, the minister of interior must assess the panel’s recommendations and if he accepts them, begin the process of revisiting Israel’s pork laws. Eli Yishai, the minister in question, heads the ultra-Orthodox Shas party whose constituents regularly rally for pork to be banned and who criticize Russian Israelis for eating forbidden flesh. Once the law is revised to no longer stipulate that pig farming is legal within Christian zones, banning hog farms completely may be within reach. The recent report noted that Yishai “not hesitate to deal with the issue, given that pigs are considered the epitome of non-kosher animals,” an indication of the religious biases of the panel. Given the region’s track record, maybe pigs wandering in the Southern desert won’t be so bad after all.